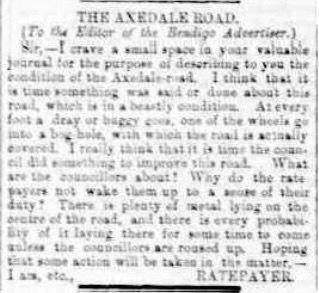 Sir,- I crave a small space in your valuable journal for the purpose of describing to you the condition of the Axedale road. I think that it is time something was said or done about this road, Which is in a beastly condition. At every foot a dray or buggy goes, one of the wheels goes into a bog hole, with which the road is actually covered. I really think that it is time the council did something to improve this road. What are the councillors about! Why do the rate payers not wake them up to a sense of their duty? There is plenty of metal lying on the centre of the road, and there is every probability of it laying there for some time to come unless the councillors are roused up. Hoping that some action will be taken in the matter. A second report by Dr. Gaffney stated – “I inspected the houses where there had been typhoid fever, and especially the sanitary conditions of those dwellings and outhouses. I find there are two sanitary systems in vogue – one a “pan” system and the other the “pit” system. In a great number of instances the articles used as ‘pans’ were much too small to be adequate. It must be borne in mind – and this is most important – that not only solid but also liquid excretia must be provided for as as the typhoid baccillus is demonstratable in the urine voided by typhoid patients. Given that the receptacle is adequate for both forms of excreta, the next thing is to consider the disposal of the contents. Burial at a depth of at least 2 ft is essential and in such a place, that there is no possibility of the infection of water supply. There should be provided in the privvies in this system, some disinfectant solution which should be used regularly. It is also very necessary that these receptacles should be protected from flies, which are a most important factor in the dissemination of typhoid fever. The pit system is a good one if the precautionary measures mentioned later are carried out conscientiously. But if these precautions be neglected, then the pit system would be an extremely pernicious one. Carelessness or neglect of the precautions would form each pit into an incubator for the typhoid bacilli and would increase in number and virulence to an enormous extent. The first essential is that there be provided a large amount of lime at hand and that each person use it freely. The second is the protection from flies, as in the other system. All water for human consumption must be boiled, and all milk sterilised, and scalded. All food must be protected by means of wire covers, etc from flies. Cleanliness of person, especially in those who have the handling of food, is of paramount importance. I am afraid that there is going to be a good deal of typhoid fever this year, and in order to check it, and prevent it getting a hold on the community, it will be necessary to exert the utmost care in every detail. With regard to Axedale, the distressing seasonal conditions prevailing are the most important factor in this outbreak, and the small number of typhoid cases during the past couple of summers, has given rise to a certain amount of carelessness on the part of the residents, which must be guarded against this summer”.